However, Rawls’ work is systematic and impressively robust, so it is important to view the entirety of his thought if we are to understand the consequences at hand. The core of Rawls’ ideal theory–which is the target of my criticisms–is built around his distinction between liberal and decent peoples. He structures this work by justifying the just international order–what he calls the Society of Peoples–for liberal peoples, and then subsequently for decent peoples. Thus, though I wish to focus on decent peoples, we must first make sense of liberal peoples in order to understand the relation between the two and the effect that it has on the Society of Peoples. Further, there is an important terminological note: Rawls uses the term ‘peoples’ rather than ‘state’ as a way of “distinguish[ing] my thinking from that about political states as traditionally conceived, with their powers of sovereignty” unlimited in domestic affairs that are then used to justify war as a matter of policy (Rawls 25). I will use the term ‘peoples’ interchangeably with the term ‘society’. With this in mind, it is easiest to understand what a ‘people’ is by viewing how Rawls defines both liberal and decent peoples. We begin, then, with liberal peoples. They “have three basic features: a reasonably just constitutional democratic government that serves their fundamental interests; citizens united by what Mill called ‘common sympathies’; and finally, a moral nature” (23). The first of these is simply the idea that the people themselves maintain a “reasonable” amount of control over their government and its implementation. They have some sort of significant political voice–whether via a written constitution or custom, a policy of referendum or a parliamentary system–and their society “is not directed by the interests of large concentrations of private economic and corporate power veiled from public knowledge and almost entirely free from accountability” (24). Simply put, the people maintain a (reasonable) amount of power over their society’s political destiny. Second, common sympathies requires that a people have the desire to exist together as a community. This often implies a universal culture, language, religion, or something similar, but not necessarily. Plural societies may have common sympathies based in “political principles that will […] enable us to deal with more difficult cases where all the citizens are not united by a common language and shared historical memories” (25). Either way, only the desire for social ties and a common government is needed to meet this requirement–the source of that desire is irrelevant. Rawls focuses, as he says, exclusively on decent hierarchical peoples without any hints as to the criteria for a non-hierarchical decent peoples. This issue, as we will see, is an important lacuna in The Law of Peoples as this ‘category is reserve’ needs substance in order to account for the peoples who are decent (or who might even be said to be plainly good) but cannot be said to have a decent consultation hierarchy. But to return to Rawls’ current point, decent peoples, however defined, provide a baseline level of justice both domestically and in their interactions with other peoples. As such, they are worthy of full-membership in the Society of Peoples. Decent peoples are thus Rawls’ way of extending the Society of Peoples to something more than a simple international liberal order. Rawls gives a definite character to this concept by a list of criteria which define a decently hierarchical people (having now entirely focused on decent peoples with a decent consultation hierarchy). First, decent peoples secure human rights for every individual in their society. Rawls’ particular minimalist conception of human rights is important and will be discussed further below. Second, decent peoples “impose bona fide moral duties and obligations (distinct from human rights) on all persons within the people’s territory” through their laws (66). These obligations provide a ‘common aim’–another concept to be discussed in more detail below. Lastly, this kind of people has a legal system consisting of individuals who believe “that the law is indeed guided by a common idea of justice” (66). The common aim is a communal idea of the good and the just which the society is directed toward through the second of the two basic principles, the decent consultation hierarchy. This hierarchy “allows an opportunity for different voices to be heard” within the political life of the society (72). As he typically does, Rawls conceives of this consultation procedure along a sliding scale with liberal ways, imagining the liberal method to be the pinnacle of justice while the decent consultation hierarchy merely meets a baseline level, being just just enough to be fully acceptable. The decent procedure is not (fully) democratic and does not give the voice of a vote to each individual, but it does allow individuals to influence political matters in some way. “Persons as members of associations, corporations, and estates have the right at some point in the procedure of consultation […] to express political dissent, and the government has an obligation to take a group’s dissent seriously and to give a conscientious reply” (72). In this way decent peoples meet this requirement of justice. An important aspect at work here is Rawls’ connection between these two principles: individuals living in the society have discrete political wills that are connected through a consultation hierarchy into a common aim. This does require a conception of subjects as “free and equal citizens, nor as separate individuals deserving equal representation” but it does imply that individuals in a decent society are seen as “decent and rational and as capable of moral learning as recognized by their society” (71). Individuals are thus imagined to be (politically) discrete and as such are capable of learning the communal code of ethics taught by their society. Within this system, their opinions cannot be claimed illegitimate or disregarded. Additionally, Rawls claims that the institutions charged with passing down “the appropriate sense of justice” are integral to any just society (15). These institutions are the concrete, practical location of moral learning. The way Rawls’ imagines and defends these principles demonstrates, as we will see, the way he conceives of political subjectivity. Decent peoples thus understood, Rawls can make his case for their inclusion in the Society of Peoples. But before that, it is beneficial to be explicit on the character of the Society of Peoples. This term refers to the order that connects societies who abide by the Law of Peoples, “a particular political conception of right and justice that applies to the principles and norms of international law and practice” (3). Simply put then, the Society of Peoples is the just international order of peoples who interact with a common understanding, overcoming the traditional problems and failures of international relations in which no laws or institutions govern. More substantially, this purpose is manifested in securing human rights. The reasonableness of a people implies, in the domestic case, the consultation hierarchy that, at its core, shows a “concern for human rights [that] leads them to limit a state’s right of internal sovereignty” (42). This concern is then reapplied to international cases as a direct focus on human rights, limiting a people’s interactions with other societies by demanding that their actions conform with an understanding of and respect for these rights. Being (at least) a decent peoples is the standard of inclusion because only once a people can be called decent can it be said to protect human rights. Anything less by a people in its domestic and international actions would be antithetical to the purpose of the Society of Peoples. The (lack of) length in this list makes evident the minimalism in Rawls’ conception. Many of the notions that define a liberal account of justice are lacking, and thus unnecessary for full membership in the Society of Peoples. Rawls’ international order consists of the (perhaps) limited end of securing this minimal account of human rights. But it is this very minimalism that allows Rawls to extend the Society of Peoples and include decent peoples. Requiring a wholly liberal understanding of rights and persons would, again, limit the Society of Peoples to only liberal nations. International standards are lowered to the baseline level to extend inclusion. “Our aim,” Rawls says, “is to extend the Law of Peoples to decent societies and to show that they accept the same Law of Peoples that liberal societies do. This shared law describes the kind of Society of Peoples that all liberal and decent societies want, and it expresses the regulative end of their foreign policies” (63). In accepting decent peoples on the grounds of these few human rights, Rawls accepts societies who, in some cases, blatantly deny rights central to the vast majority of western conceptions of justice and who openly discriminate against some segments of their population. Many critics have argued that any society with this character cannot be accepted as full members of a just international order, claiming either explicitly or implicitly that the list of basic human rights requires more than Rawls gives it. Martha Nussbaum, one of the more prominent critics of this type, argues against the contractarian nature of Rawls approach, claiming that “the human dignity of people who are fully human is omitted” in Rawls’ definition of a decent peoples. These people, she convincingly concludes, should therefor not be (fully) accepted to the Society of Peoples (Nussbaum 250). In this capacity, Nussbaum represents a criticism against the multiculturalism Rawls advocates that accepts (certain kinds of) the discrimination in other cultures simply because it is that culture’s way. This refutation of Rawlsian criticism is an argument I do not wish to challenge. The respect he gives to these kinds of discrimination, as Nussbaum argues, is a serious dilemma with his theory. Leaving that side of the criticism as it is, I wish to push Rawls in the other direction and show that his toleration is also not truly tolerant. Even with his minimal conception of human rights, Rawls’ thinking excludes certain societies who are deserving of inclusion (and, in fact, far more deserving that some decent hierarchical societies). Though these excluded peoples may fail Rawls’ explicit criteria and list of rights, they achieve the spirit and end of those rights. As such, they should be afforded respect and inclusion in the Society of Peoples. The problem, as we will see, lies in Rawls’ implicit assumption of political subjectivity that he leaves un-theorized. Any theory of justice necessarily rests on this notion, and the confusion inherent in Rawls’ use of the subject confuses his theory, causing the double failure of being tolerant to the unjust while excluding the just. Rawls explicitly states that the difference between decent and liberal societies lies in their treatment of their own subjects. A decent people “does not treat its own members reasonably or justly as free and equal citizens, since it lacks the liberal idea of citizenship” (Rawls 83). The lesser (but still baseline) level of justice in a decent peoples is based on the way that society conceives of the persons in it. More specifically, decent peoples do not apply the property ‘citizenship’ to its members. Every liberal subject is also a citizen–has the property of citizenship–in a way that members of decent hierarchical societies do not. But decent peoples by definition must still grant a certain understanding to their subjects to be considered decent. This method of differentiation, however, implies a conception of the subject to whom one could apply the property of citizenship. Rawls tacitly assumes that the individuals in every society conceive of themselves, insofar as they are political subjects, as the kinds of things that can have properties of this type ascribed to them. This further implies that political subjects are discrete, atomized, and able to be thought of as subjects separately from the rest of their society. In order to judge a people indecent, Rawls would claim that its subjects are not only not citizens, but also lack moral learning and respected opinion of subjects in a decent society. But claiming that a subject unjustly lacks these properties precludes the possible conception of a subject to whom these properties are non-applicable. Rawls’ theory presupposes a particular conception of the subject and uses it as a basis for judgement, without considering the possibility that thinking the subject in different terms could provide a different way of securing the fullness of a human life that his human rights are meant to protect. But Rawls obviously imagines his work in a different light. “A decent hierarchical society’s conception of the person […] does not require acceptance of the liberal idea that persons are citizens first and have equal basic rights as equal citizens” (66). Discussing the liberal idea of personhood and thinking he is relaxing the concept of a subject, Rawls overlooks the presuppositions that make the idea of subject-as-citizen possible, staying in a framework of subjectivity which he does not justify. He ignores the fundamental question of the nature of political subjectivity, of what it is to be a human in the political sphere of life. By refusing to question this basic assumption, Rawls limits his discussion to only what kind of properties are applied to a person rather than how it is a subject holds these properties in the first place. Rawls’ theory precludes the possibility that a person may be conceived of as only gaining subjectivity through being a member of a people, or only inasmuch as he is a member of a people. Briefly touching on this point, as hinted at earlier, Rawls claims that it is possible for human rights to be secured by “associationist social form […] which sees persons first as members of groups–associations, corporations, and estates. As such members, persons have rights and liberties enabling them to meet their duties and obligations and to engage in a decent system of social cooperation” (68). However, in discussing both “rights and liberties” and “duties and obligations” that can be ascribed to individuals (not in conjunction with the rest of their group), Rawls imports the atomized character that underlies the fundamentally liberal conception of subjectivity into this supposedly non-liberal thought, judging societies on masked liberal standards. What Rawls calls the “liberal idea of persons” is truly only a distinction within the liberal conception of the subject–he fails to consider the possibility that the basic conception itself could differ. Rawls sees that different conceptions of the person are possible, then, but fails to discuss its most fundamental aspect. He considers here different metaphysical conceptions, but ignores the interrelation with the nature of subjectivity–which is to say, what it is to be a person in a politics. Nonetheless, Rawls’ entire theory is predicated upon this conception. The two principles and three criteria used for defining decent peoples (§ 3) would all face important differences with an alternative conception of the subject. The individualized way Rawls thinks of the common aim requires a liberal conception for its individualization, and a consultation hierarchy could only ever be necessary if one conceives of political subjects as discrete individuals to be molded together into a society. The legalist notion of a right itself depends on thinking of the subject as a discrete individual who lays claims on other individuals. Moral obligations face the same problem, while the very existence of legal officials as Rawls discusses them obviously rests on a particularly liberal conception of law. To clarify the preceding arguments, it is necessary to elucidate what an alternative conception of the subject might be. 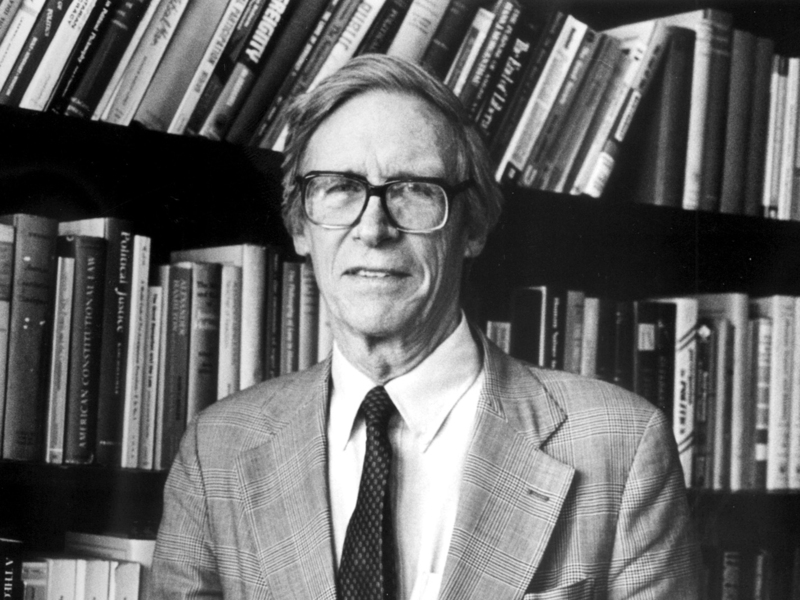 There are two ways in which the following conceptions differ from Rawls: (1) the first does not imagine individual subjects to be discrete and atomized, implying that they cannot be thought of separately from the society in its totality; and (2) the second does not imagine individuals as the kind of subjects to whom properties such as rights or citizenship could be applied. But a preemptive note is necessary. It may seem as though these two conceptions posit untenable understandings of what it means to be a human being. However, these conceptions are not metaphysical–they are specific to the realm of politics. In the same way that many liberal theorists do not apply rights to individuals in the state of nature, or to modern day hermits, these conceptions and their implications apply only within a political situation. They are conceptions of what it means to be a human in the space of politics and to interact with others in that space. They are also presented as conceptions that a society shares–not as conceptions individuals have within a liberal society. It is only in this light that they carry their full force. Moreover, we may still conclude in the end that they are unjustified or even untenable, but in doing so we would go beyond Rawls’ theory and demonstrate the necessity that he supplement his thinking and justify the theory of the subject that underlies his accounts of justice. Thus I will not justify or advocate for either of the following conceptions. I will merely argue for their possibility and, in doing so, argue that this aspect of political philosophy deserves attention. Though one may respond to these conceptions with questions of how they relate to the metaphysical nature of human beings, that question must also be asked of Rawls. And it is that very question whose importance I wish to show. The first conception underlies certain collective societies. These people imagine their community as a totality to which each individual is inextricably connected and apart from which individuals cannot even be though of in a political manner. The community constitutes the subject as such. Thinking of the subject simultaneously invokes the whole. To be a political subject is simply to be in this totality. This is not to make the metaphysical claim that the individuals do not have separate thoughts, desires, actions, etc., nor that those individual characteristics are not recognized. It means that these characteristics, when involved in anything political, only exist within the collective totality of the society. ‘Citizenship’ is thus the type of property that is only applicable to the community as a whole. The only political being is that whole–within political issues, the individuals are un-differentiable so only the whole community can be thought of as the subject of politics to which ‘citizenship’ could apply. Individuals are only imagined as already part of the whole, so applying citizenship to them is nonsensical. The collective conception of the subject denies the discrete nature of the liberal subject and posits individual subjects as always connected parts of a singular whole. The most obvious (Rawlsian) indecency of this people is the lack of property rights which Rawls includes on the short list of necessities for a human life. But within this society property rights are nonsensical, as the notion of property rights only has meaning if one imagines politics as ascribing parcels of land to atomized subjects who enter into a political relation in order to draw geographic boundaries corresponding to their subjective borders. Further, this does not imply that individuals in this collective society would not have access to land, tools, etc. Those goods are simply not divided up and legalized in the liberal way. Additionally, Rawls imagines morality being passed to the new generations via institutions that instill the moral learning particular to the society. But this once again rests upon the notion of politics as that which parcels out goods. Specifically, this conception of moral learning imagines the political realm as that which reinforces the lines that atomize subjects as a way of clearly defining and supporting rights claims. But with the collective conception, subjects belong to a political body only as a totality of persons, thus this thinking of moral learning cannot exist unchanged in our new conception. Finally, the idea of a consultation hierarchy is unnecessary for the collective people. A whole unthinkable as anything but a whole, this alternative people decries this notion of a consultation hierarchy as an importation of a liberal notion of the subject that defines various individuals and groups, drawing discrete borders around individuals. Lacking property rights, moral learning, and any sort of consultation hierarchy, the collective people fails Rawls’ standards and is judged indecent. And yet we can imagine these individuals happy, with fulfilling lives that they would choose of their own accord. This is, after all, the spirit of human rights: ensuring that the life given to a person by a politics is one of the possible lives she would choose for herself given a fair opportunity to choose. The members of a collective society of this kind face no discrimination nor subjection. They achieve the ends of human rights while circumventing the explicit list of Rawls’ criteria. Property rights are unnecessary as property can only belong to the community as a totality. Individuals can still have access, in this way, to whatever is necessary while circumventing the need for rights that arises in liberal societies. Additionally, conceiving of themselves only as a collective implies that political issues are a matter of the collective as a totality. The need for a consultation hierarchy disappears but doesn’t affect the ability of the individuals to guide their political future, as that future is inherently a part of their subjectivity. The morality specific to politics is thus also always a fact of what it is to be a subject, and the moral learning Rawls requires is unnecessary for ensuring (something similar to) reasonableness. A society based on this conception of the subject can secure the spirit of human rights while still being condemned as indecent and excluded from the Society of Peoples because they fail Rawls’ test. The second alternative conception of the subject accepts the discrete nature of individuals, but posits actions as the important tie between these discrete subjects rather than some property of the individuals. A kind of neo-Aristotelian approach given character in Foucault’s discussions of the ancient world (see, e.g., his discussion of the sodomite and the homosexual in A History of Sexuality, Vol. 1), this conception imagines subjects as incapable of having properties such as citizenship or rights. Any discussion of rights, in this way, implies the same liberal conception of subject contained within legalist discourse in a way that our neo-Aristotelians would not accept. Their focus on actions requires a politics that judges, forbids, and requires actions rather than claiming that actions must be limited based upon a quality belonging to the person. A neo-Aristotelian constitution would be a list of actions, not a list of what is owed to subjects. An example from the realm of ethics: a murder is judged as evil not because the victim had a right to life that was denied, but because the act of murder has the property of being wrong, evil, etc. (for whatever reason). The property of injustice belongs to the squeeze of the trigger or the thrust of the knife, while the victim and transgressor lie outside that kind of judgement, being included at most as a secondary derivation. Property rights could not be applied to persons, but in Lockean turn against Locke, would be attributed to the work done on the land or with the tool. Property rights in the liberal sense would once again be nonsensical–individuals are merely the arbitrary location of an act, not the entity to be theorized. Further, it is not readily apparent what a consultation hierarchy could be in a society of this kind. It could very well be the case that organizing acts in the way liberal societies organize rights could happen without anything that could be called a consultation hierarchy. There would be no need to mesh a common aim with the wills of the people and although the acts making up those aims would need to be organized, the fact that those acts are not conceived of as rights seems to necessitate a different kind of institution. Once again Rawls would condemn the neo-Aristotelian people to the class of indecency and deny them the respect of membership in the Society of Peoples. The lack of rights as a category would be unacceptable for Rawls, the lack of property contracts and ownership over one’s life are enough to condemn a people of this kind. Focused on the liberal category of ‘person’, Rawls’ standards of decency are nonsensical to a neo-Aristotelian people whose conception of subjectivity implies an entirely different kind of right whose existence Rawls does not allow for. And the questionable existence of a consultation hierarchy only lessens this people’s worth according to Rawls. But the spirit of human rights could be perfectly achieved and inclusion in the international order fully justified–or perhaps even required–by justice. The outcome of the neo-Aristotelian conception merely finds this spirit via actions rather than persons. As such, a happy and fully dignified life is possible, and could be guaranteed under this conception. Ascribing these sorts of properties and judgments to actions is certainly unintuitive, but doing so would still protect from murder, theft, subjection, etc. It could very well be the case that this society would be chosen by certain individuals and that its members have the very thing human rights reaches for without discussing rights. In conceiving of the subject in a way secondary to rights, a neo-Aristotelian society may not be focused on individual livelihood directly, but it protects something which is fundamental to that livelihood. In doing so, it deserves inclusion and it deserves to be judged as just. One may at this point object, with some merit, that the alternative peoples are too utopian, too far from the typical society to be of any import to international justice. They are, says the critic, either impossible or unimportant. But both the collective and neo-Aristotelian conceptions have existed and continue to exist to various degrees. Certain tribal nations and anarchist societies (like the Israeli kibbutzism) share the collective nature and property conceptions of the first conception. Foucault, as mentioned earlier, points out that certain eras of the Greek polis maintain something similar to the neo-Aristotelian conception. The liberal subject is thus a reflection of a historical period and its intuitive nature stems from our proximity to that period. But other conceptions are possible, and though they do not have much influence on geopolitics in the current day, they have before and could again. A robust theory of international justice must then take them into account. Even if Rawls wishes to accept only a liberal subject, this fact implies that he must consider these alternative conceptions if only to dismiss them. But his theory as it currently stands does not have the tools to argue against them. In not considering the problem at all, Rawls’ leaves his work resting upon a lacuna. It should be noted again that Rawls admits the possibility of a non-hierarchical decent people. This “other kind of decent people is simply a category I leave in reserve, supposing that there may be other decent peoples whose basic structure does not fit my description of a consultation hierarchy, but who are worthy of membership in the Society of Peoples” (63). While not addressing the problems that arise in his discussion of human rights, this category could be used to solve some of the other difficulties pointed to with alternative conceptions. However, even if Rawls would make such an argument (which is by no means apparent), he has still left a large gap in his theory. Some may wish to claim, along these lines, that because they achieve the spirit of human rights, Rawls would include the alternative peoples in the Society of Peoples. But there are problems with this thought. First, Rawls makes a practical argument, claiming that including decent peoples will push them towards liberalism. “[L]iberal people should have confidence in their convictions and suppose that a decent society, when offered due respect by liberal peoples, may be more likely, over time, to recognize the advantages of liberal institutions and take steps toward becoming more liberal on its own” (62). Though this thought may be acceptable for decent societies who actively discriminate, it shows an unjustified lack of respect to alternative societies who meet all standards of justice (as measured by the spirit of human rights). These other conceptions have destroyed the sliding scale of justice that Rawls used to measure decent peoples by liberal ones such that trying to push them toward liberalism shows an implicit denial of the worth of their conceptions and societies. Additionally, because collective and neo-Aristotelian societies are likely to be small nations lacking in power and wealth in the modern world, it is possible that Rawls would imagine them to be “burdened societies”: those societies “whose historical, social, and economic circumstances make their achieving a well-ordered regime, whether liberal or decent, difficult if not impossible” (90). Another possibility demonstrating a hidden disrespect, writing off alternative societies as burdened would once again show Rawls incapable of adequately accounting for their differing conceptions of (political) subjectivity and recognizing the worth therein. Finally, the fact that Rawls theorizes international justice through a contractarian approach in which peoples are accepted into the Society of Peoples based upon a social contract may itself imply a liberal subject. That is to say, it remains a question unasked in this paper whether Rawls’ method, in addition to his content, implies a liberal subject such that he could not account for a different conception without completely altering his approach. Much of the confusion in Rawlsian toleration may actually be explained by this dependence upon a legalist and contractarian method, but that is another complex question that Rawls presupposes an answer to. Thus it is impossible to discuss that question with any depth here. In refusing to comment directly upon his notion of the political subject and to make any explicit arguments for it, Rawls leaves his theory–as profound, robust, and impressive as it is–sitting on an unexplored concept that despite its historical longevity is not obviously justified. Altering conceptions show that there are very compelling and complicated issues that require a deep investigation of the concept. The complexities behind the subject cannot be assumed away, nor thought of as inconsequential. Rather they must be taken up directly by any theory of political justice in order to end the confusion that plagues Rawls. The most fundamental theoretical unit of a political philosophy, the conception of the subject must be argued for.